We had a fruitful day starting at Perry Bar in Birmingham and heading north to Preston. The objective was to visit Recliners Direct, who specialise in the sale of recliner chairs. We had found their website in Australia and noticed there was a showroom. It seemed a good idea to physically try out the various types and models of recliner chairs before purchasing deciding on a model to buy. After all; we will be sitting in them for much of the time during the next five years. The visit was very successful and we have identified the model and colour chairs we want. Leaving Preston we headed south to Solihull where Jan had identified there was a “Lakeland” store. She wanted to look inside one of their shops to see what they sold. Unfortunately we had a couple of minor problems when we arrived in Solihull. The first was “Felicity” (the gps) took us to a mall where all the car parks were full; then the low fuel light illuminated. We asked Felicity for the nearest petrol station however she was even more geographically embarrassed than us. This is something I must rectify. Anyway, by the time we filled the car we decided to go directly to Rugby. I continue to be impressed with the courtesy of UK drivers. Today I decided to emulate them and flash our rental car headlights at oncoming traffic to signal I would give way Unfortunately it resulted in a large volume of windscreen washer liquid on our windscreen…. Oops! Our new Travelodge is actually so new the location isn’t in the Travelodge information I downloaded to the gps. I used Google Earth to find the location and then transferred the information to Felicity. We have nine nights here at £19 per night. I made the bookings whilst we were in Australia and I managed to get them wrong (of course). Instead of booking all nine nights together as a block I purchased them separately. This confused the Receptionist (and everyone else except me!). Our room overlooks Rugby Railway Station. After our first night I can assure you it’s a very busy station! However, unlike the Travelodge at Stafford; it has a reasonable 3 Mobile internet signal. I happened to notice this building from our hotel room window. Yes; it’s one of the Rugby Railway Station car parking buildings. However that’s not the thing that caught my eye. 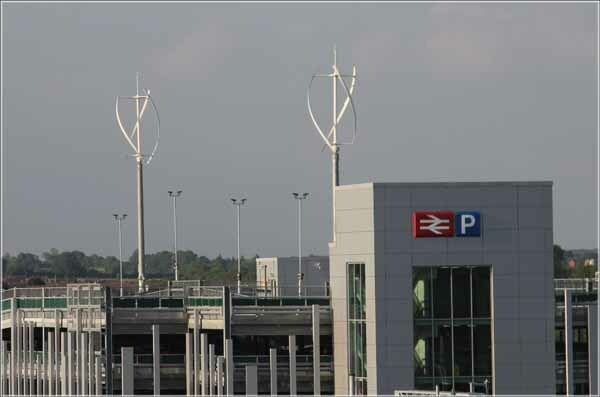 It was the unusual wind turbines on top. I can see three of them on different buildings in this area. How common are they, and how much energy do they produce?